When I was looking into printer ink options, I wondered what Amazon Dash Replenishment is about. I saw that many printers that are eligible for HP Instant Ink are also eligible for Amazon Dash Replenishment. 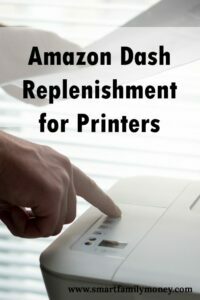 What is Amazon Dash Replenishment for Printers? It is a service through Amazon that allows smart devices to monitor their supplies and reorder through Amazon when it’s running low. Currently, printers are one of the most popular devices that can use this service. How Does Amazon Dash Replenishment Work? You purchase an Amazon Dash Replenishment compatible printer. You sign up for the service from HP. When your printer senses you are low on ink, it places an order (you have 24 hours to cancel). Can I use Amazon Dash Replenishment to Order 3rd Party Cartridges? As I discussed in my post about HP Instant Ink, 3rd party re-manufactured cartridges can be a way to save money on ink. Unfortunately, the HP Amazon replenishment terms of service state, it can not be used with non-HP inks. Does Amazon Dash Replenishment Work With Any Printer? No, Amazon Dash Replenishment does not work with just any printer. It only works with a small list of compatible printers. Is Amazon Dash Replenishment a Good Deal? Amazon Dash Replenishment is a convenience service. You’re still ordering brand-name supplies. If your goal is to save money, then Amazon Dash Replenishment is not a good deal. If your goal is to save time, it might be worth it to you. I recently wrote about the question, “Is HP Instant Ink worth it?” Many of the printers that are able to use HP Instant Ink are also able to use Amazon Dash Replenishment service. Which is a better deal? Below is a chart that shows the approximate cost for printing pages with HP cartridges from Amazon Dash compared to using HP Instant Ink or 3rd party cartridges. Would I Recommend Amazon Dash for Printers? No, I would not recommend using the Amazon Dash Replenishment program for printers. I think there are much less expensive ways to get your printer ink. Previous Post: « Is HP Instant Ink Worth It?